The Behringer ADI21 Acoustic Amp Modeler Direct Recording Preamp DI Box combines the features of an active DI box with Behringer’s proprietary microphone/tube emulation. The Behringer ADI21 Acoustic Amp Modeler Direct Recording Preamp DI Box combines the features of an active DI (direct injection) box with Behringer’s proprietary microphone/tube emulation. But you don’t have to use the emulation feature. The ADI21 also functions as a superb active DI box. The Blend control allows you to mix the amount of modeled tone with your instrument’s normal output. The resulting sound is more natural with smooth saturation, just as if your guitar were being miked. Armed with an onboard 3-band EQ, with sweepable mids to keep feedback under control, the ADI21 effectively eliminates the harsh harmonics of piezo pickups. The output is laid out on ¼ inch TS or balanced gold-plated XLR connectors, which can be used to send a low-impedance signal to the mixing console or straight to tape. Included is a ground lift switch to eliminate annoying ground loop hum problems. You can power this little lifesaver with a 9 V battery or a PSU-SB DC power supply (not included). Although my Taylor 214CE sounds beautiful just straight up! The ADI21 greatly enhances the overall sound and tone of my guitar. And for $29, way worth it!! I ran my Martin throughthe pedalinto my Fender acoustisonic90 and after a couple of minutes tweeking iy I found the sweetspot. It cleaned up the harshness nicelyand took away some of the "processed" sound pretty well. Next, I plugged it into my Fender Excelsior tube amp. Suprise! I did'nt have to touch a thing. It sounded good with the same settings I used for the solid state amp. I did'nt give it 5 stars because I think it could use a couple of basic effects like chorus and reverb. All in all, the pedal doesthe job. Well worth the $30 investment. You certainly get more than you pay for with this pedal. It's a decent preamp for acoustic guitar, although it doesn't have the detailed sound you get from more expensive units. You lose some of the "shimmer." But you gain a solid, controlled volume boost, as well as a compression that helps with piezo pickups. The construction is actually quite solid. I think it'll hold up fine on the road. Overall I'm happy I got it. It gives me what I needed. First, this is a necessary DI with volume for my K&K passive pickup acoustics. Through the PA, it is very quiet and transparent. In recording, it is about the same hum as my Shure57 mic. Second, it's more than a DI with interesting tones ranging from bluegrass, country, folk, jazz, and alt for my guitar. Even string bass for my fretless acoustic bass. 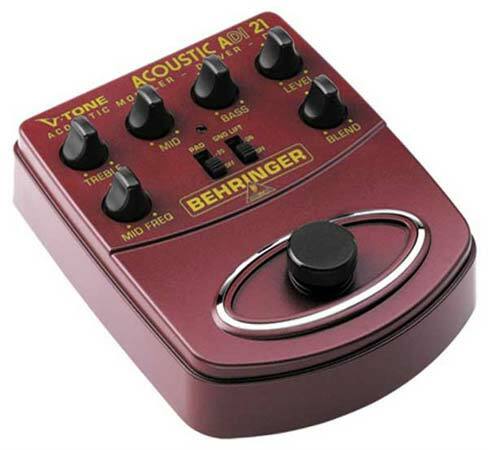 This is a must have for solo performing acoustic guitarist, and a great backup for those with higher-end DI boxes. Very surprised to hear what this can do. i was a bit wary at first as it was so inexpensive, but it just sounds great!!! Works great with various tone options. Mellow to spanky with a touch of overdrive. The only drawback is battery operation. I had mine hooked up for maybe 20 minutes and it killed a new Duracell 9v. I have since used it with an adapter and no issues. It is built very solidly and does a good job of shaping the tone. I use it with both acoustic guitar and ukulele with undersaddle pickups. It does a very good job of getting rid of the piezo quack from the pickups.